I turn into a brutal murderer this time of year. Ask the tens of thousands of victims I killed just this week. I’ve got a bucketful of rotting corpses sitting on my patio that I’ll be adding to in just an hour or so. My preferred method of dispatching my victims? Suffocation. They trash around for a couple minutes and then its lights out—forever. And nothing gives me more pleasure. Hey, it’s them or me. You see, it’s Japanese Beetle season here at Edelen Acres. Being organic fruit farmers ain’t easy. About the only things that kill Japanese Beetles outright are pesticides strong enough to kill a motorcycle gang or the traditional method of dealing with them by hand. So that’s what we do. We pick many of them by hand and dump them into a jar of soapy water. The soap plugs their breathing holes and that’s that. It’s a lot of work, but weirdly satisfying, too. We divert many of the beetles by stationing a couple pheromone traps far away from the trees. The first year we used the traps, we had them too close to our trees and they ate the trees anyway. This year I put them in the middle of nowhere on our land and that seems to work far better. I’m using a natural kaolin clay mixture to coat our cherry trees, the hardest hit of our fruit varieties. The first year we had the trees in, we took a day trip over to the county next to us to visit the Amish general stores, only to get home and find that in one afternoon the beetles had eaten our tender cherry trees leaves down to lace. One day. We tried natural pyrethrin (as opposed to synthetic) powders that summer, but the bugs ate the leaves and then died. 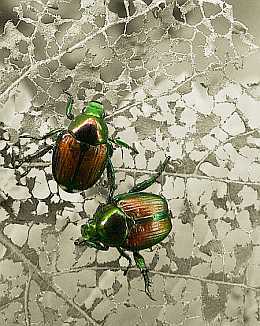 Didn’t see the point in applying pesticides, even organic ones, if the beetles eat the leaves and then die. The end result is still a bunch of eaten up leaves and a highly distressed plant. You’ve got to stop the beasts before they eat anything and pesticides are not going to work when you’ve got several hundred Japanese beetles coating your tree. If each one takes a hundred bites before the pesticide does them in, your tree’s done for. We put up netting last year. However, the trees grew so fast the branches deformed against the netting. Now we’ve got a few trees with branches that look like something out of a Dr. Seuss book. Plus, netting a big tree is a lesson in futility. Beetles will find the smallest gaps in the netting and they’re in by the droves. So I’m trying the kaolin clay barrier. It seems to work well. We’ve been under assault by the beetles for about ten days and my cherries have hardly been touched. When it rains, though, it has to be re-applied. Still, it’s natural and washes right off. They use kaolin in makeup. Obviously not a health threat. I suppose you could use it to thicken gravy, but it has a certain yuck factor. 😉 But if the beetles don’t like eating it, that’s fine by me. Talk to me about that curse in Genesis and I’ll tell you just how much a curse it is. Weeds. pests, drought, even fire. We’ve had a drought going on in this area and the farmers all have that anxious look. Sure, it’s rained, but five minutes of sprinkling followed by a clear blue sky and a hot sun ain’t gonna do it. Downpour. That’s what we need right now. Don’t need more stinking non-native Japanese Beetles or any other non-native beasties. Ask me about the non-native, invasive weeds we get around here, too. God had a plan and we threw a huge wrench in it didn’t we? We had our own ideas, but consider the outcome. That kind of arrogance lives on. You can see it in farming. Pesticides coat our food and pool in the fat stores in our bodies. They linger for decades in the soil. They run off into our water supplies and poison the fauna. Haven’t seen a frog or salamander lately? They’re the canaries in the coal mine, folks. Our man-made pesticides killed them off. And now the true pests are resistant to what we spray. We thought we had an answer but it’s not a very good one. Scientists splice jellyfish genes into corn and then tell us nothing’s wrong with that. Then those jellyfish genes wind up moving into the genetic structure of other grasses surrounding our corn fields. We solve one problem to create another, another that may well be far worse than the original. God’s given us natural ways to combat problems. We just need to trust them. It’s like that in every aspects of our lives, isn’t it? Sometimes the old, simple ways are the best ways. But we don’t trust them. Science tells us otherwise and we get paranoid that we won’t keep up with the times. Well, the times they might well be a-changin’, but the wise man doesn’t give up wisdom to suit the age. Remember, Adam listened to the wrong voice in a certain situation and look where it got us. Our churches launch some guaranteed program backed by the slickest marketing and the best sound bites from the hottest church leaders and we hope and hope. A couple years later, that program stands forgotten. Sure, it was billed as the pesticide for whatever plagued us, but it wasn’t God’s way, was it? No fruit. It’s all about the fruit. If all our work produces no fruit, then we’re just being wasteful. Sadly, that’s what a lot of churches are doing, just wasting time, money, resources, and people’s patience. I think our problems with patience underlie the greater issue here. Yes, people get upset when the newfangled program bears no fruit, but it was sterile from the get-go. What people need is patience for the simple ways that work, the real discipleships that spans decades, not months. You try too hard to rush the fruit and you wind up with tasteless fruit. Think your typical grocery store here. Sure, you bought a package of mass-produced, industrial-strength strawberries. But they taste more like straw than berries. We may be doing the same with our disciplemaking process. Better to go local, go organic, be patient with the old ways that served us for eons—even when it comes to making disciples. God knows we have enough spiritual pests out there, but we can’t poison our young “plants” in our attempts to kill the weeds or wipe out the bugs. It’s the modern equivalent of Genesis 3:6. We want, and take shortcuts to get it. We need to do more with less, not have more with less effort. In one of the tragic ironies of modern times, agriculturalists are trying to wean third-world farmers off of chemical pesticides and fertilizers in an attempt to make them more productive and profitable, and the farmers are having nothing of it. Two generations of chemical companies peddling their wares has created a breed of farmers resistant to nature. One of the best books I ever read was Better Off: Flipping the Switch on Technology by Eric Brende. I wouldn’t go as far as he did to make the change to a simpler life (I like electricity), but the ideas he raises about what technology does to us, how we wind up serving it instead of the other way around, should give us pause. I’m a bit tired of the modern concept that we need to keep adding to produce better outcomes. What about subtracting? What can I subtract? Or what can I naturally keep as is? I love lunch meat. To me, no more perfect food exists than the humble sandwich. But I don’t like the staggering amount of processing that goes into making lunch meat. Does it really need a half dozen different kinds of preservatives? For years they told us that nitrite and nitrate preservatives weren’t harmful. Now they know otherwise and are trying to backpedal. I’ve recently started buying Hormel’s Natural Choice lunch meats because they’ve found a way to remove all the preservatives by using crushing amounts of pressure to kill bacteria in the packaged meat. I know that Hormel’s still buying meat that’s not organically raised, but I’ll support them in this trend away from adding. In fact, at this point in my life, I automatically question anything that begins with an addition to something already existing. God did a perfect job making this world, and though sin ruined it, He still found a way to make it work. He made ways for us to find answers that don’t throw the Creation into further turmoil. I trust His thinking. I wish more people did. There is an experimental organic farm near my church, the Rodale Research Center. They focus on sustainable agriculture. One of our attenders came from Ghana to a fellowship there years ago. He’s since, through a circuitous route, gone into business for himself: Greenway Pest Control. His aim is to treat all manner of pest issues organically and safely. I’ve tried to help him as best I can. He has dreams of taking the concept global, especially to the third world (and he’s still focused on the message of sustainable agriculture). You sound a little bit like him! I appreciate what you said about patience. Pastors certainly don’t often have the trait as you described it. Do you think they lack it because they don’t trust God’s methods, or, are they longing for personal success (like most striving Americans) and don’t have time to wait, or maybe they are under pressure from Boards and memberships who, stockholder like, demand performance yesterday? The issue is complex, but ultimately if we use synthetic agents to produce growth we’ll get synthetic fruit as a result. Church as that glass weave basket mom used to have on the diningroom table filled with rubber fruit. It looked all right from a distance, it was useless if you were hungry. My wife an I are trying to run our farm using sustainable methods. It blows my mind that some folks in the Church consider the whole idea of sustainable living as some plot by the antichrist. They turn the whole thing into some kind of wacky conspiracy. I don’t get people sometimes, especially in the Church. As to patience, I think all the reasons youmention are valid. Our business mentality translates into our churches as if we’ve got to be profitable quarter after quarter or the shareholder will revolt and kick the board and CEO out. No long range plan or goal exists. But that’s insane. And it’s insane not only in our churches, but in our businesses. The Asian countries and their businesses are going to clean our clocks one day because, to them, it’s all about long term strategies. They possess remarkable patience. The Church used to have remarkable patience, too, but we adopted our culture’s and business’s love of the short-term. That ruined much of what we do. Now we operate with impatience and reap the results. Good read as always. Like the metaphor (real world example as it may be) of the beatles to the church (pesticides/fruit). My wife, four kids, and myself recently went back to Chicago for an extended weekend visit. I was shocked by some of what I heard and what I saw at our old church. Short term focus to get mediocre results with little to no long term goals or planning (with few exceptions of course). We had looked forward to returning and worshiping, what we came into was lots of people needing counseling – the beatles had invaded, the pesticides overwhelmed. We everyone there, bumps bruises and secrets and we pray, even more so now for them. Persistence. Patience. Prayer in faith. I am having problems with those blasted Japanese beetles again this year, too. They reached our community only last year. I am thinking about eliminating the shrubs they like to munch on just so I don’t have to deal with the little buggers. They smell bad. Problem is that I really like the shrubs they like. Bummer. But since my allergies are bad I have to have a pretty low maintenance landscape. I did the “shake the bugs into a bucket of soapy water” thing every day for a couple of weeks last year. It worked well, but my shrubs still looked terrible. Let me know how your new method works.